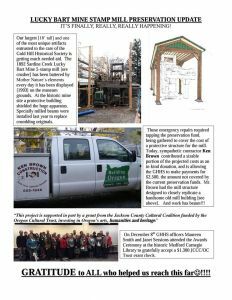 Our largest (18' tall) and one of the most unique artifacts trusted to the care of the Gold Hill Historical Society is getting much needed aid. The 1892 Sardine Creek Lucky Bart Mine Stamp mill (ore crusher) has been battered by Mother Nature's elements every day it has been displayed (1993) on the museum grounds At the historic mine site a protective building shielded the huge apparatus specially milled beams were installed last year to replace crumbling originals. Those emergency repairs required tapping the preservation fund, being gathered to cover the cost of a protective structure for the mill Today, sympathetic contractor Ken Brown contributed a sizable portion of the projected costs as an in-kind donation. 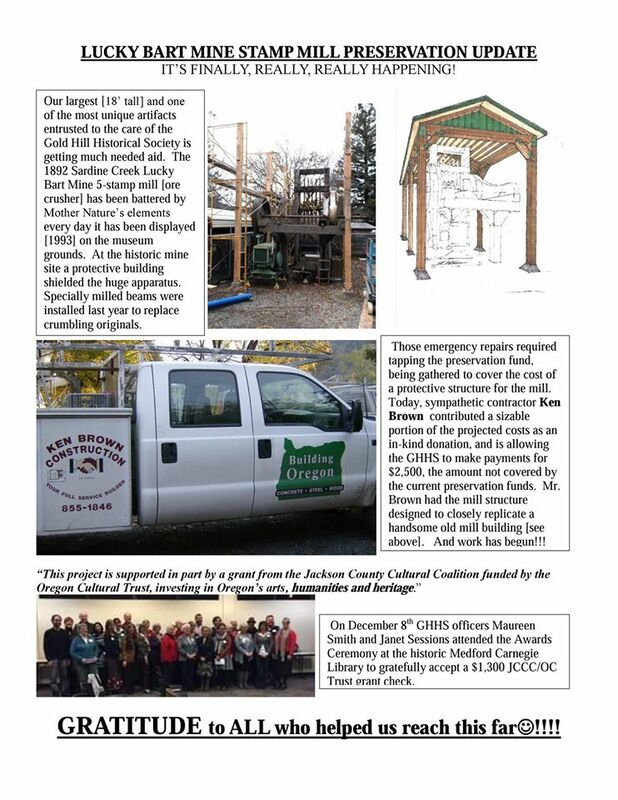 Mr. Brown had the mill structure designed to closely replicate a handsome old mill building (see above). And work has begun!!! "This project is supported in part by a grant from the Jackson County Cultural Coalition funded by the Oregon Cultural Trust, investing in Oregon's arts, humanities and heritage." On December 8th GHHS officers Maureen Smith and Janet Sessions attended the Awards Ceremony at the historic Medford Carnegie Library to gratefully accept a $1,300 JCC/OC Trust grant check. GRATITUDE to ALL who helped us reach this far!!! !